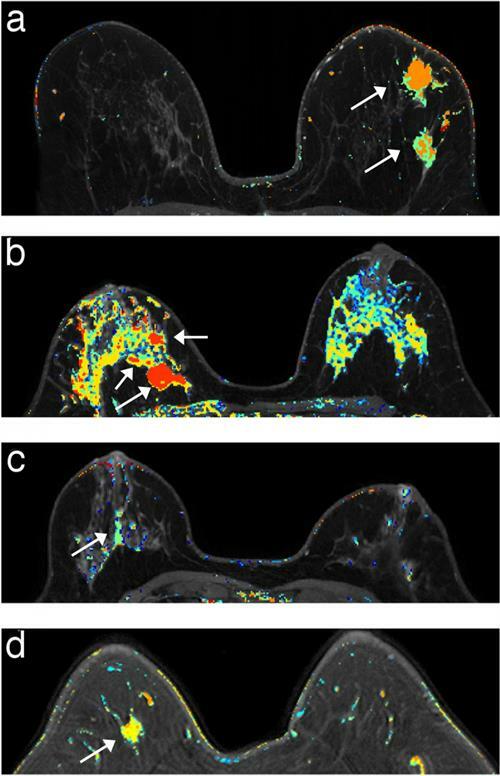 September 14, 2018 -- Women at high genetic risk for breast cancer benefit more from twice-yearly dynamic contrast-enhanced breast MRI (DCE-MRI) than from annual mammography, according to research published online August 28 in Clinical Cancer Research. A team led by Dr. Olufunmilayo Olopade from the University of Chicago Medical Center found that DCE-MRI every six months worked well for the early detection of invasive breast cancer in this population, finding smaller cancers compared with mammography. "This is the ultimate goal of breast cancer screening, detecting node-negative, invasive tumors less than 1 cm," said co-author Gregory Karczmar, PhD, also of the University of Chicago, in a statement. The study included 295 women with a lifetime risk for breast cancer greater than 20%. Of the total cohort, 157 (53%) had one of 11 known breast cancer-related genetic abnormalities; 75 had BRCA1 mutations and 61 had BRCA2 mutations. The women were evaluated by a physician and a genetic counselor, after which they were scheduled for a clinical breast examination, a DCE-MRI exam every six months, and a digital mammogram every 12 months. Over the course of the study, the researchers performed 2,111 DCE-MRI scans and 1,223 mammograms and found 17 cancers: four ductal carcinomas in situ and 13 early-stage breast cancers. Fifteen of the 17 cancers were found in participants with pathogenic mutations: 11 involved BRCA1, three involved BRCA2, and one involved CDH1. All cancers were smaller than 1 cm. DCE-MRI every six months performed well for the early detection of invasive breast cancer in genomically stratified high-risk women. Image courtesy of Fred Pineda, PhD, University of Chicago Medicine. The 17 women in whom cancer was found were tracked for a median of 5.3 years, and all are alive and free of systemic disease, the group wrote. Mammography is effective for most women, Olopade noted. But for those at high risk who are getting a DCE-MRI every six months, "annual mammograms can be eliminated," she said in the release.